NICOLE RICHIE NEWS: Nicole Richie attends Christina Aguilera's Birthday bash! Nicole Richie attends Christina Aguilera's Birthday bash! Christina Aguilera's 28th Birthday party was a star studded event, to name a few celebs Nicole Richie, Joel Madden, Paris Hilton and Benji Madden attended! - I wonder if there was any tension between Paris and Benji!? It was held at Osteria Mozza in LA and they where all looking fabulous .. 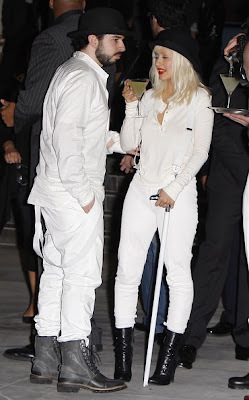 I was a little confused by Christina Aguilera and her beau's choice of outfits but as it turns out it was a clockwork orange themed party! Which i guess explains Nicole's orange outfit, but she works it well and even added her Miu Miu pouch handbag!! Browsing through the site and saw an insignificant mistake. Paris wasn't at the party but a few minutes before the partying ppl arrived that's why her picture was in the same gallery. She's not even in costume and i think they wouls have talk about in that people article. that said i looovvveeee your site, really insightful.